Cool water is circulated all around the joint providing optimal 360 cooling. Cold water therapy system can provide cool water for 6-8 hours on one single fill-up. Cryotherapy unit can be left on continuously without interruption. Cold water therapy system provides added compression to further reduce pain and inflammation. Reduces chances of skin damage by continuously circulating the fluid. May operate from floor level,NEWLY DESIGNED RESERVOIR,improved design: 10 MINUTE SETUP TO START THERAPY. Use 3-4 hours; then easy to recharge, add ice and water! and Ultra safe design and engineering. Cryotherapy Arctic Ice Cold Water Therapy system helps reduce pain and swelling and facilitates rehabilitation. Cold water therapy system provides up to 7 hours of continuous cryotherapy for a variety of indications. Cold therapy device uses a patented semi-closed loop system, the cold water therapy system maintains a constant and precise temperature modality. Cold therapy device also comes with a free cold pad. Cold therapy devices utilizes continuous circulation compression cryotherapy. This technique is more advanced and is used in the cold therapy pain management cryotherapy unit which continuously circulates cool water all around your injured joint while providing compression to the area. Continuous circulation compression therapy is delivered through the unit which circulates cooled water from an insulated container through pressurized tubing into a large cooling pad which surrounds the injured joint providing compression. When the fluid in the pad is warmed by your body temperature, you are able to simply recirculate it to keep the area cool. 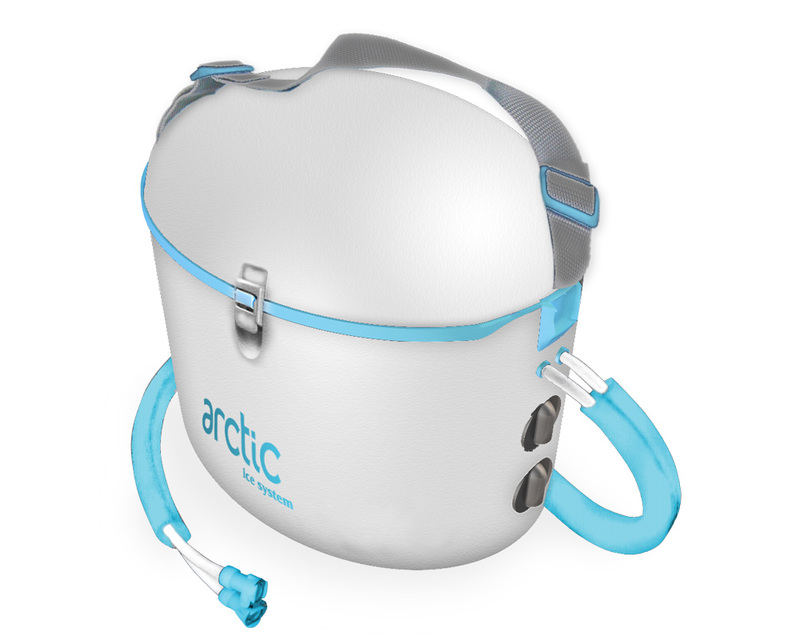 The Arctic Ice system can be used from the earliest stages of post-operative recovery, through rehabilitation, to post-recovery home use for the treatment of chronic pain of any body part. The system is available with various therapy pads that fit around any body part or joint to treat soreness, pain, or discomfort. Delivers localized cold therapy to patients in the home or during their hospital visit. The AIS uses a motorized pump to circulate cold water to the desired body area. It comes standard with a universal cold therapy wrap that fits many different areas of the body including. Acute injuries, sport injuries, post-operative or post-traumatic pain, edema. I am currently under the treatment of a physician who has prescribed this ARS or AIS product. I will read and completely follow all directions provided by the manufacturer, as well as instructions from my physician regarding treatment times, and protocols. I understand that I will assume all responsibility for the use/misuse of this product. I will contact my physician immediately in the case of any unusual reactions caused by the use of this unit. I understand that Healio Health/Helio Living is only a distributor and in no way assumes responsibility for any injury it may cause due to malfunction, misuse, inappropriate application, or other reason. By clicking “add to cart” you certify that the above statement(s) is/are true. Cold therapy parts come in contact with water which may contain bacteria that can come in contact with skin/incisions. By regulations, we cannot accept returns on cold therapy units/parts unless there is a problem with their operation. In which case if the unit is still within its warranty period it will be replaced with a new one.